Ever since I started cooking, I have used Olive Oil in place of butter. In rare occasions, I will pull out my Southern heritage and use a few slices of butter but I will never be a Paula Deen. I was given a challenge from California Olive Ranch to take a dish that most people would use butter in and reinvent it using olive oil. On Thanksgiving, I brought out my camera and knew instantly what I wanted to feature after my future brother in-law went back for seconds on a dish he thought he would dislike - roasted Brussels Sprouts. Preheat oven to 425 degrees F. Meanwhile, heat oil over medium heat in a roasting pan or large skillet. Add the pancetta and cook until golden brown and crisp. This took quite a while for me since I wanted to make sure the pancetta was extra crispy. Remove the pancetta to a plate lined with paper towels. Add the shallots to the pan and cook until soft. 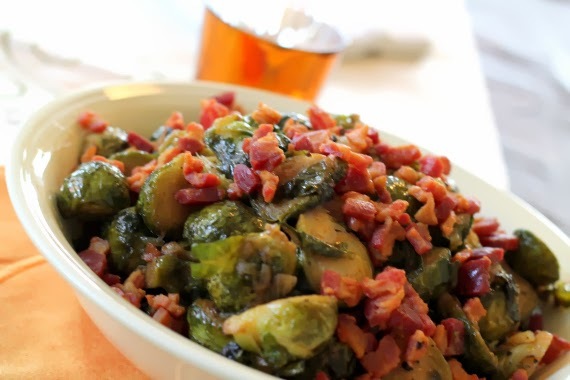 Add the Brussels sprouts and toss to combine. 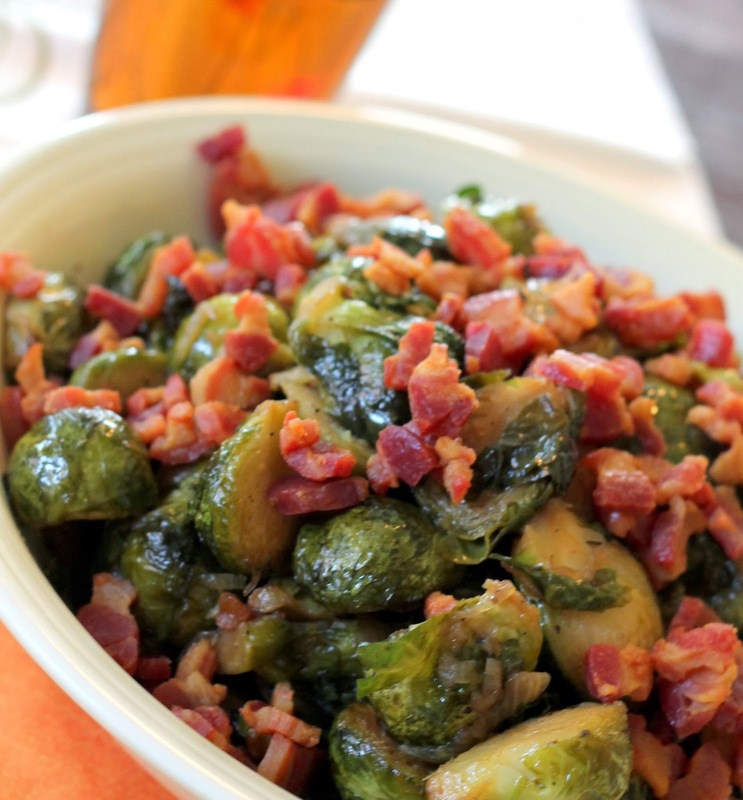 Season with salt and pepper and roast in the oven until the Brussels are cooked through and golden brown. Transfer to a platter and top with the reserved pancetta. My friends at California Olive Ranch want to enlighten my readers about the health benefits of using Olive Oil instead of butter. Their 100% extra virgin olive oil will add rich flavor to your mashed potatoes, depth to your holiday turkey, and produce a flaky, tender crust for your pumpkin and pecan pies. This holiday season, they have partnered with Anolon Gourmet Cookware to not only transform your holiday menu, but your kitchen as well. 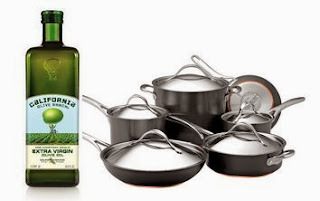 I am giving away 3 bottles of California Olive Ranch and an open stock Anolon Cookware Roasting Pan. Enter my contest via the Rafflecopter Widget below & leave a comment letting me know what your favorite recipe is using Olive Oil. I know it sounds so simple, but my favorite thing to make with olive oil is scrambled eggs. I did the paleo lifestyle about a year ago and so I stopped using butter. I was worried how the olive oil would make my eggs taste, but it's delicious! I wonder why I ever used butter to begin with! YUM!!! As you know, Brussels are my favorite veggie and these look delicious. I use Olive oil in everything and rarely use butter. I cannot wait to make this recipe! I like using Olive Oil in place of butter for baking! I use olive oil all the time, especially when making pasta and sauce. I use olive oil for nearly all my cooking! Love it! I use olive oil to roast veggies. I use olive oil for chicken and to roast veggies! I cook most of my veggies in olive oil! I love to cook chicken and potatoes! I love cooking vegetables with olive oil! I like to cook sweet potatoes and asparagus in olive oil. great recipe and fun post, thanks for sharing! My favorite thing to cook with a Good olive oil is homemade tomato gravy sauce... first sautéing the onions and garlic and fresh herbs to start off with in a great olive oil is the best way to begin.... an extra touch is to have some to dip crusty bread into when serving up the sauce as well! I cook just about everything with olive oil! One of my favorite things is to sautee mushrooms and onions in olive oil with salt and pepper. Then I put them on burgers, chicken, steak, etc. I cook everything with olive oil! I Love to Cook Pasta in Olive Oil..I also use it to Brown my Meats and for just about everything. I make these really great olive oil muffins...mmmm! Everything! That's pretty much the only oil other than coconut that I use to cook with. I cook almost everything with olive oil, too. I love using olive oil in cooking my vegetables on the grill. pasta has to be my favorite to coook olive oil with!